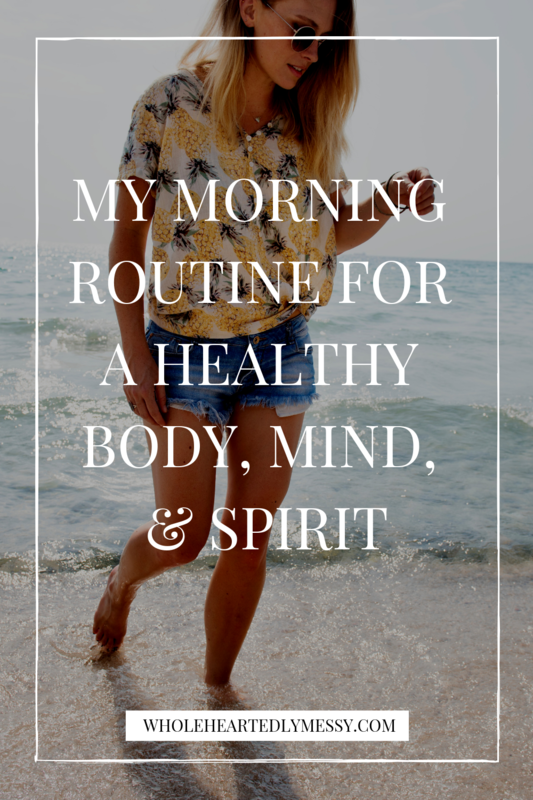 Okay, I know that there are 9,003,567,340,321 posts about morning routines lately, but I’ve gotta tell you mine because it has literally changed my life. I’ve never been a morning person. In fact, I used to loathe mornings. Ew, sunlight. Ew, birds singing. Ewww, waking up. Ya feel me? For years, I literally had 9 alarms that went off every morning, and I would wake up on the second to last alarm (because the last one was only for emergency use!). I would scramble out of bed, quickly brush my teeth and attempt to not look like a troll, have maybe two minutes to just breathe, and then fly out the door. BUT I DIDN’T WANT TO WAKE UP EARLIER. However, God started nudging me. You see, I read about how Jesus woke up every morning to spend time with His Father (Mark 1:35), and I wanted that same connection with my Father. At this point, God started to convict me. You see, I had been putting important things on the back burner of life (like my physical, spiritual, and emotional health) because by the time I got home at the end of the day, I was too tired. As a result, life swamped me, and I lost touch with what truly matters. It was time to make my priorities a priority. I threw my figurative lab goggles on and donned my white lab coat that makes me feel all smart-and-stuff, and I did an experiment. I woke up at 5:15 every morning, a whole 1.5 hours earlier than normal. AND IT WAS THE BEST THING EVER!!!!!!!! Seriously, it changed my life. So, I’m sharing my morning routine with you in the hopes that you will find it as an encouragement to make your priorities a priority. Duh. I don’t think I have to explain this one. 2.) Thank God for 3 things. Before I get out of bed, I make sure that my first thoughts are praises to my King. It sets the tone for my day and changes my mindset from an Uggghhhh-I-Have-To-Get-Up to a Yay-I-Get-To-Get-Up. Every night, I put a bottle of water on my bedside table, so I just reach for it when I wake up. This little act has helped so much. It (1) stewards my body and (2) wakes me up more. This is another simple yet powerful act. It makes my room feel tidy (so less stress) and gives me a little boost because, if I do nothing else today, at least I made my bed. Plus, it discourages me from crawling back into bed. 5.) Get on my knees in surrender. Yes, I literally get on my knees, on the floor, bowing down and praying. 6.) 5 minutes of exercise. I set a timer or use an app and just move my body for 5 minutes. This gets my endorphins going, boosts my metabolism, wakes me up, and makes me feel good. Even though it’s just 5 minutes, those 5 minutes add up. 7.) Get dressed & listen to bible. I’m following a chronological Bible listening plan using the app Dwell, and it’s awesome. There’s something refreshing about just listening to the Bible. 8.) Grab my breakfast & start eating. I make breakfast at night before I go to bed, so I just grab it out of the fridge. Eating 30 minutes to an hour after waking up boosts your metabolism, so I’m making it a habit. I eat it slowly over about an hour, mostly because I’m not much of a breakfast-eater. 9.) Stretch & pray out loud. I seriously love doing this; it’s the highlight of my morning. I have a list of people and things I pray for, and I go through it as I stretch. I also make it a point to pray out loud because I feel like I mean it more when I pray out loud. And I really hope that I scare the crap out of the enemy, too. I have a list of biblical affirmations and promises that I declare over myself every morning. This has seriously been a game-changer and has changed the way I think. Focusing my mind on the Truth and shoving out the lies is so so so so so important, and I highly recommend you do this. For some examples of what you can declare over yourself, see this website. 11.) Write daily Bible verse. I write down YouVersion’s daily Bible verse. Writing it makes me slow down and absorb what the verse is saying. 12.) Recite daily Bible verse. Once again, declaring Truth over myself is seriously so powerful. 13.) Write daily word and definition. I take this time to turn my eyes and heart to God and dig deep in the Word. This looks different on different days, but I usually print out a passage, tape it in my journal, and verse map it. 15.) Pray over my to-do list and schedule. This is something else that has completely revolutionized my life. I invite God into my day, ask for His strength and help, and surrender my tasks to Him. I cannot tell you how much this has helped me. I am like 100000% more productive since I’ve started doing this. Do it, do it, do it, do it. This just reminds me of where I want to go and how I can get there. Again, this helps me stay on track. 18.) Send Bible verses to friends & family. For about six years now, I’ve been sending bible verses, prayers from VOM, and devotionals to some of my friends and family. 19.) Gather my things for the day. This is pretty self-explanatory. I get my backpack, computer, gym bag, and lunch all ready to go. And I finish my breakfast. 20.) Read a Christian book. I love to read, so I make sure that I schedule in time to do this. 21.) Leave & Eat the frog. I don’t know where I learned this from, but Mark Twain said “if the first thing you do each morning is to eat a live frog, you can go through the day with the satisfaction of knowing that that is probably the worst thing that is going to happen to you all day long. Your ‘frog’ is your biggest, most important task, the one you are most likely to procrastinate on if you don’t do something about it.” (Source). In other words, I do the hardest task first. And that’s it. Pretty simple, really, but so powerful. I look forward to waking up early, and it changes my entire day. By making my priorities a priority and cultivating a healthy body, mind, and spirit, I have been filled with more joy and energy. Friend, I hope you will be able to implement some of these habits into your life, whether it’s in the morning, on your lunch break, or before you go to bed. Make your priorities a priority. Set aside time for what truly matters, and have the discipline to say no to what gets in the way. WHAT’S YOUR MORNING ROUTINE LOOK LIKE, OR WHAT ARE SOME HABITS THAT HAVE HELPED YOU? I’D LOVE TO HEAR THEM! COMMENT BELOW!